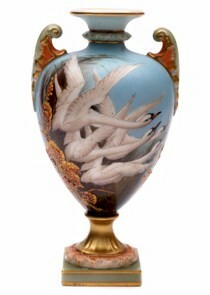 The middle years of the 19th century were something of a turbulent period for porcelain production in Worcester with several changes of ownership and more than a few amalgamations, but by 1862 the Worcester Royal Porcelain Company was formed. The subsequent acquisition of Grainger & Co in 1889 and especially the bringing into the fold of James Hadley & Sons either in the last few years of the 19th or early 20th century led to a lengthy period of stability and arguably the start of Worcester's golden era. A time when it attracted a vast team of 'top notch' decorators with the ability to paint almost anything on porcelain, each piece signed and effectively dated. 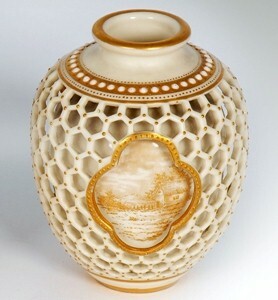 perfected by Harry Davis, dated 1910. The repertoire seems endless starting with the generic 'Hadley Roses', but including the work of other flower painters such as George Cole and Frank Roberts, the sheep of Harry Davis and his apprentice Ernest Barker, the signature 'Highland Cattle' in a landscape of Harry Stinton and his father John Stinton, the game birds of James (Jas) Stinton, the swans of Charles (Chas) Baldwyn, the songbirds of William Powell and just about any kind of bird could be painted by Walter Powell. by Harry Stinton, dated 1922. 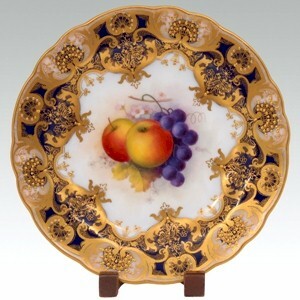 However, the greater volume of factory output was set aside for the fruit painters and whilst some might contend that Richard Sebright was perhaps the master fruit painter, the list of serious contenders seems almost endless including Harry Ayrton, Horace Price, Albert Shuck and William Ricketts (both of whom also dabbled in flowers), and Kitty Blake who specialised in blackberries. 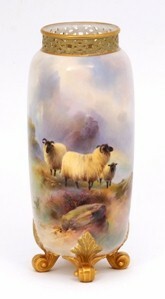 Royal Worcester production from this period wasn't just about artists - it could also boast a great stable of modellers. Whilst reticulation (the painstaking cutting and piercing) might not strictly be considered modelling, it was a process that required all the skill, precision and patience that George Owen could muster. He had to work meticulously, but quickly enough so that the moistened clay did not dry out too much whilst he was working on it and one slip or a crack during firing and the look of a piece was destroyed. Nobody really knows how many pieces had to be destroyed as he took great pains to keep his art and his studio shrouded in mystery. 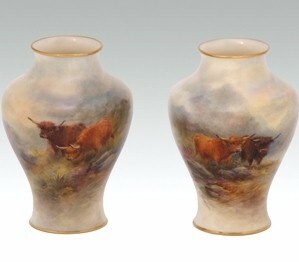 A pair of James Hadley figural comports, dated 1891. 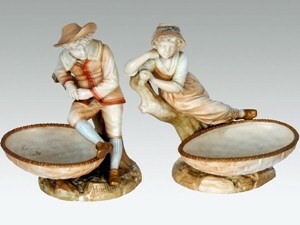 The earliest figural modeller of this period has to be James Hadley who, whilst most renown for his rather saccharine Kate Greenaway inspired figures of children, also undertook series depicting the countries of the World, but perhaps the greatest number of Royal Worcester figures were produced by the Doughty sisters; the younger Freda had a flair for producing figures of children and her elder sibling Dorothy favouring birds. Another modeller skilled at reproducing the natural world was Doris Lindner, whose repertoire included dogs, cattle and racehorses.